ASPIRE55 - Asia's First Virtual Retirement Village - Megazip Adventure Park - Join Us for High Level Fun! 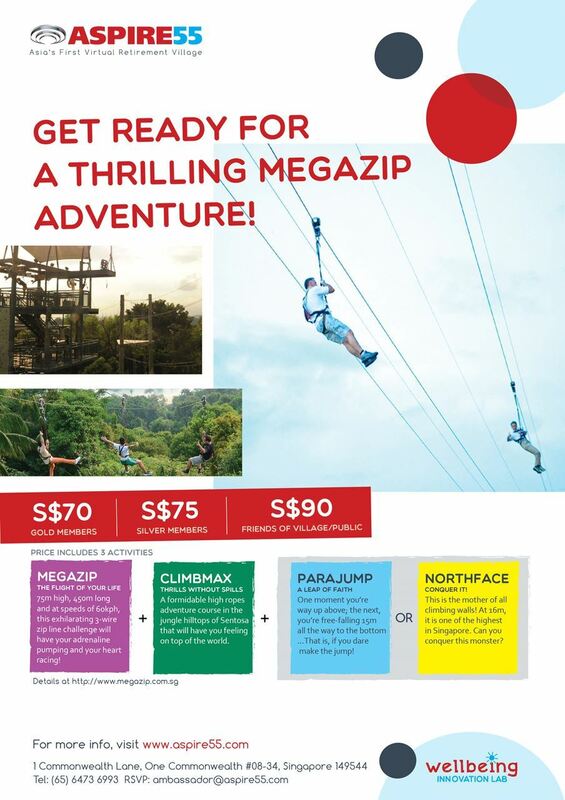 Megazip Adventure Park - Join Us for High Level Fun! A multitude of height defying activities to drive your adrenaline or to overcome acrophobia. Join us for a fun, exciting and heart pumping experience! Register now! Limited spaces, limited to a maximum of 20 members only. Please note that each participant will sign the liability form provided by MegaZip operators on your health conditions and if you are able to participate in these activities. It is advisable for members with severe heart condition or hypertension to seek doctor's clearance before signing up for this activity.